Discover the beautiful North Coast region of Port Stephens, with its diverse blue water paradise, pristine waterways, golden sandy beaches, eco-diverse marina and National Parks. Nature is the centre of all that is Port Stephens, making it the perfect escape from cosmopolitan Sydney. Situated in New South Wales's Hunter Region, Port Stephens is just a two and a half hour drive from central Sydney yet may as well be a world away. Prepare for a weekend of whale and dolphin watching, sand dune sliding, water activities and world-class accommodation and dining. Non-stop attractions are sure to keep visitors occupied for the length of their stay, while those who like to take it slow will enjoy the quiet pockets of natural escape. Whether you're looking to holiday among the marine life (boat fishing or free diving) or are excited to spend a weekend riding camels and exploring the regions diverse nature and landscape, there's something for you in Port Stephens. 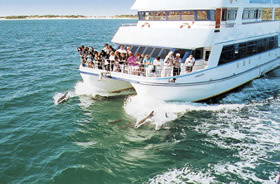 Port Stephens tours from Sydney are also a great way to get to know the region with dolphin watching cruises, sandboarding fun and up close and personal experiences with native reptiles often included. Enjoy expert commentary and a genuine 4WD tour as you enjoy Port Stephens like a local. Those who wish to just chill out will also love the opportunities for health and wellbeing in Port Stephens. Indulgent spas and pampering are readily available and often offered by your hotel or accommodation.